Many more readers come to this blog during the week as opposed to the weekends. So in case you missed some things over the weekend, here are a few short items to catch up on. Greenedge will unveil their new jersey but last night there was a storm in teacup over the design. The image comes via Mark Beretta. The design certainly doesn’t look inspiring but I don’t think it’s the real jersey. A well-informed correspondent has emailed to say the design isn’t finished and as a couple of others pointed out, the team is set for a proper launch on the eve of the Tour Down Under. Taste is always subjective but when designing a jersey, it’s not just how cool it looks at the café stop. It must be visible, both when racers look for team mates but also for TV viewers on helicopter shots. Visibility and identification are what matter, only yesterday in the Vuelta and the GP Plouay I heard TV commentators getting Sky and Garmin-Cervélo mixed up thanks to their black kit. As you probably know the job of a commentator isn’t easy, with images on a small monitor but at the same time they’re broadcast pros. If they can’t spot the difference, how can an average viewer? Each false reference to the team is a valuable loss of publicity. Talking of the Vuelta, Bradley Wiggins seems to the bookmakers favourite to win the race in Madrid after blasting away his rivals on the stage to La Covatilla in the Sierra Bejar. There’s a big time trial today and we’ll learn more. First every time someone has a good day in this race, they seem to go backwards the next day. But that’s no iron rule and Wiggins will test himself against the likes of Cancellara, Tony Martin, Vincenzo Nibali and Jurgen Van den Broeck today. Second, he’s done well on the steady climbs but the upcoming mountain stages might prove less suitable to his steady style. Either way, he’s proving to be one of the best stage racers in the world now. Yes, you read that right. On the podium of Paris-Nice, he won the Dauphiné and now he’s a contender in the Vuelta. It’s strange to think that several years ago Cofidis were frustrated by his ways although arguably his first real sign came when he rode the Tour with Cofidis and placed fifth in the Albi time trial in 2007. It gets subjective but Wiggins has won races this year whilst other pretenders have not. Note his strong position in the Vuelta was helped a lot by Anglo-Kenyan Chris Froome too. There have been many tales of teams looking to merge this year. Some proved wild rumour, some came true like the Quick-Step and Omega Pharma. I’ve written about the topic before, my thoughts were that the teams were being forced to merge for defensive reasons. This isn’t 1+1 = 3. Plus now-familiar rules on team size mean you can’t merge two squads of 25 riders together without a massive fall out. The latest story is that Leopard-Trek is looking to merge, possibly with Radioshack. There’s the connection with Trek. A well informed reader mentioned this weeks ago. We’ll see what happens here but it’s a reminder that the top team in the world, based on the World Tour rankings, doesn’t have a full sponsor. An exciting finish to the race. Now named after local newspaper Ouest-France (“West France”, actually France’s biggest selling daily), it is held in the Breton town of Plouay. It’s an unremarkable place at the junction of several roads and with an obligatory chateau. Wikipedia says its famous for the bike races. They held the Worlds here in 2000 and the GP organisers are teaming up with the French Federation to bid for the 2017 worlds. The annual GP already has an air of the worlds with its circuit-based route, plus the Women’s World Cup race. Thor Hushovd was the fastest in the sprint yesterday, but Slovenian champion Grega Bole soloed away for the sprint and Simon Gerrans manage to survive from his strong late move. It’s too early to view this in the light of the worlds but all the same, many Norwegians might be making the relatively short trip to Denmark to support Hushovd and Boasson-Hagen. Yesterday Norway overtook France on the UCI’s national rankings. On Saturday there was a piece about Germany’s Thüringer Energie Team. Yes there’s Team Net App at Pro Continental level but I wanted to look back a few years at the lesser team from Thuringia as it’s featured Marcel Kittel, Tony Martin, Patrick Gretsch and John Degenkolb. Full story here. Good point re visibility of a team jersey on TV, from the air and, most importantly, on the road by your own team mates and DS’s. I’m pretty sure the design is far from finished. Who uses short zippers nowadays anyway? I really hope that’s not the finished design. Really. Radio Shack w/ Leopard would be a disaster. I can’t imagine what the stars of each team would accomplish together, other than having a heated inner-squad dispute at every race. Garmin and Cervelo did it well, but neither team had stage race “winners” in abundance when they cam together. @Starr: not so sure about the Garmin-Cervelo merger. See Thor Hushvod’s frustration with the team since the Spring Classics as exhibit A. 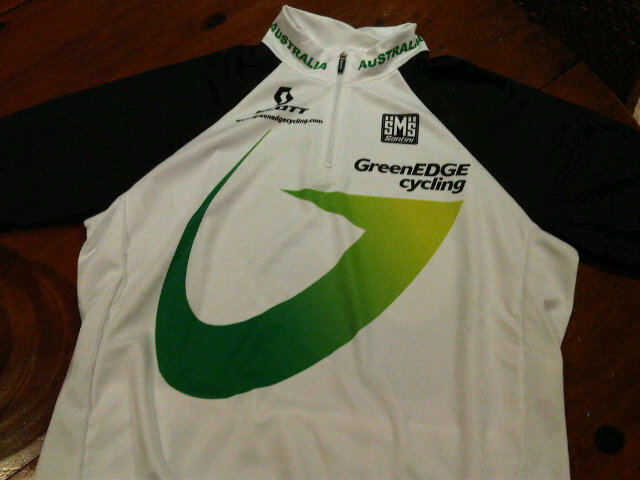 Re Green Edge jersey. Tour Down Under is some time off and Monica Santini (MD of Santini) assured me only recently that jersey would indeed be revealed on eve of Tour Down Under. Therefore it seems way to early to have a finished design. Likely one of several prototypes produced before the design eveolves into the finished article. The Leopard – RadioShack media coverage has focussed on the wrong team. Leopard have denied everything and I suspect that they might not be as keen to merge as RS are. There are ongoing rumblings about RadioShack ending their association with CSA’s team. The US FDA investigation weighs heavily over the situation. Any team (Leopard or otherwise) merging with RS would likely take the most of the U23 squad, the Iberians and other Europeans but not the old timers like Horner, Kloeden & Leipheimer. In any event, I’d be surprised to see much of Johan Bruyneel next year. Santini supplies our kit and I hope the Green Edge folks take some design hints from these folks– who know what they’re doing. A few years back our new gloves arrived with a SANTINI logo on the lower palm area….I thought, “what the heck is the logo doing there?” until I thought of a race winner putting his hands in the air….where the logo would show up nicely! Monica’s dad Pietro started this company in the 60’s and they know what they’re doing which is lucky for us, as they’re sort of family and it would very tough to get clothing elsewhere if we for some reason didn’t like their stuff. RadioSchleck? Well, Leopard need a qualified DS and a sponsor while Retirement Shack needs some good young riders — it might work just fine if they merged. Turns out the jersey above was created for a photo shoot some time ago and worn by a female model. The real version will be unveiled on the eve of the TDU. Cleverly or unwittingly, maybe everyone will appreciate the new design as it has to be an improvement on the image above. I’ve felt that the point about the visibility of the team was well said. However, some future improvements should be in the branding. In that, when Team Sky formed their color branding was established fairly quickly and prominently with the blue, white and black scheme. Leopard-Trek and Garmin-Cervelo were a little late to the game by “interpreting” (although it was plain to see that they heavily borrowed from the popular kit design) the same color-way into their own team identity. Would it beneficial to viewers, fans and the athletes themselves if, when a team is granted a UCI WorldTour license that there is a designated predominate color associated with that team’s kit? Thereby reducing confusion amongst all parties and truncating plagiarism in design. And forcing teams to push their team identity forward rather than copying what the new kid has done. Mark Beretta is a television sports presenter for Australia’s Channel 7 network, his regular gig is sports on the morning news program “Sunrise” (as an aside he is also a mad keen cyclist, his brother owns a bike shop, and he is a former champion water skiier). Besides the exciting finish of Plouay and watching Gerrans not only rip the field apart, it was surprising to see Gilbert unable to do much to counter the attacks. Yes, he finally pulled himself up to Gerrans wheel, but faded quickly after that. Are we finally seeing Philbert coming out of form? @velopanache: the other way round, he’s had a break and is now resuming his racing for the Worlds and the end of season classics. If Nygard is off to Greenedge, I expect the kit to be mainly black! Nygard seems to be hopping around the start-ups in their first year, Sky, Leopard-Trek, and now possibly Greenedge. On another point, I’m not enjoying the drip feeding of signings from Greenedge. I much preferred the bulk rider announcements when Team Sky formed where they released about 19 of the 28 riders over two days. Dustin makes a good point though it should be OBVIOUS to the marketing mavens why you don’t want a kit that looks like that of another team(s). Unless you think a ton of revenue will come from the newest-latest-most fashionable kit sales to the punters, you’d think you’d want something instantly identifiable on the TV screen from helicopter shots from far above. Garmin, Leopard and Sky all look pretty much like skunks in those shots, I feel sorry for TV’s Heckyl and Jeckyl who seem to have enough trouble figuring out what’s going on as it is! Sad to see the HTC jersey as there are precious few White team jerseys left not counting Germin-Cervélo’s tdf spesh. I am betting that Trek decided that it only wanted to sponsor one team. That would certainly force teams to compete or force them to work together and drop tailwind sports. Trek putting a bit of daylight btw themselves and shareholder Armstrong? @Sean – if this is the case, why are they merging with a team which is run by Bruyneel? I do not think this is about running from anyone, as much as Leopard-Trek running to better management, due to the fact they need a big sponsor. By merging, they get Radioshack (any thoughts that this has been in the works for a while), while all along getting Bruyneel (and his questionable pharmacological baggage), to help them take it to the next level. What is sad, is that I really wanted Bruyneel purged from this sport. Instead, he may well be the DS heading up the next 2 – 3 years of TdF champions. People who hire other people to run a professional cycling team do not frequent “The Clinic” on cyclingnews website, their decisions are most likely based on the managerial merits of a prospective DS. Bruyneel, in the eyes of these people, does possess credible managerial qualities of a successful DS. This is why he will stay in the sport for as long as he wants. @ColoradoGoat. Actually I also thought that this allowed Lance to put distance btw himself and Tailwind which is implicated in the whole misuse of federal funds (Lance implicated as a director of tailwind at the time or so I believe). Strange how TLT never had a title sponsor. Set up to carry the TRS torch once that team folded?